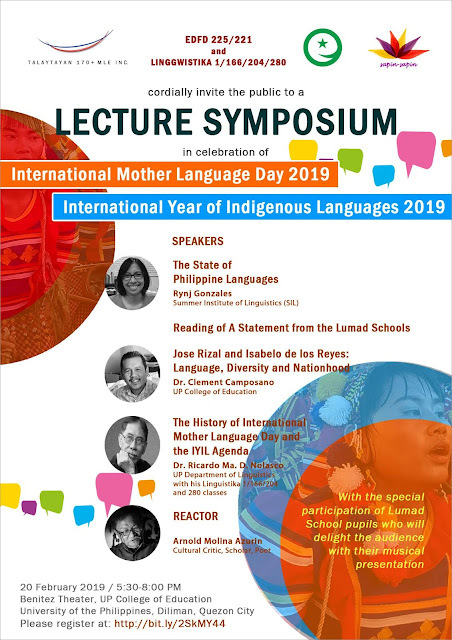 The celebration of the International Mother Language Day (IMLD) 2019 and launching of the International Year of Indigenous Languages (IYIL) at the University of the Philippines was held on February 20, 2019 at the College of Education, UP Diliman Campus, Quezon City. The event which was held after the the afternoon classes gathered 200 participants from various places. There were participants who traveled from the Pangasinan province. At the registration area, a display of mother tongue based multilingual big story books (Ayta Mag-antsi and Ayta Mag-indi languages) and MTB-MLE references was set-up. The latest book of the speaker, Dr. Clement Camposano on Jose Rizal was also on display. Dr. Marie Therese Bustos, the dean of the UP College of Education gave the welcome remarks. She narrated how she and her colleagues in the Deaf Education and SPED Department struggled to promote the Filipino Sign Language (FSL) which led to the institutionalization of the FSL through a law passed in 2018. Dean Bustos also mentioned about the nationwide research project on Mother Tongue-Based Multilingual Education that was undertaken by ACTRC, a research center that she heads (https://actrc.org/category/projects/mtb-mle/ ). Students from the Linguistics Department gave a backgrounder of IMLD and IYIL and explained to the audience how they can sign up for involvement in the IYIL website. This was followed by a presentation from learners from the Lumad Bakwit School (indigenous school) that was visiting the UP campus. They spoke about the struggles that they experience because they live in high-conflict communities in the Southern Philippines. They capped their presentation with an indigenous (Bagobo) song and a dance. SIL Representative, Ms. Rynyj Gonzales presented the current state of Philippine languages in light of Fishman's EGIDS Scale (https://www.ethnologue.com/about/language-status). She described how certain languages in the Philippines are only spoken by the elders and are in the verge of extinction. The main speaker of the evening, Dr. Clement Camposano, delivered a lecture based on his recent book “The Nation as Project”. He discussed the conflicting thoughts of Philippine heroes, Jose Rizal and Isabelo delos Reyes (who lived in the 19th century during the Spanish colonial period) about language, identity of indigenous groups in the Philippines. He underscored how the much revered national hero, Jose Rizal, saw the nation from a distant land. Due to the influence of the German Herderrian philosophy, his conceptualization of the Filipino identity was quite exclusionary (limited to lowland Christian converts). He along with other famous Filipino educated elite (illustrados) wanted to show that Filipinos were as modern and sophisticated, worthy to be represented in the Spanish Cortes (parliament assembly). Isabelo delos Reyes, on the other hand, looked at the project of nationhood as a local (probinsiyano) located at the margins (Ilocos province in Northern Philippines). Though he was well educated and well versed in Spanish, he turned to local folklores (in local languages) to inform his views. Delos Reyes as a counterdiscourse declared that he was one with the indigenous mountain dwellers. The project of nationhood is an ongoing process according to Dr. Camposano. Filipinos today should take into account subgroups like indigenous people communities, the Muslim (Bangsa Moro) groups and the Filipinos in diaspora in re-imagining the Filipino nation today. Prof. Arnold Azurin, the author of "Reinventing the Filipino" responded with his own commentary on some points raised by Dr. Camposano. He mentioned that Rizal and delos Reyes were kin. He took note of the exclusionary view of Filipino identity as one of the roots of the prevailing conflict in the Southern Philippines. Participants posted their suggestions through an online form about ways to promote, study and develop the indigenous languages. There were many who requested for more forums, training and conferences. They recommended that there should be workshops on the means to integrate indigenous language and cultures in the curriculum. There were also suggestions on popularizing indigenous languages through music, literature, films and other art forms. Both social and mainstream media should be utilized to create awareness about indigenous language concerns. And members of indigenous cultural communities should be involved in various endeavors. As a Subanen coming from an Indigenous Community in Mindanao, it is empowering on my part that our language is now given importance with the celebration of the Indigenous Mother Language Day 2019. This is not only about preserving indigenous languages worldwide, but rather a recognition of every indigenous peoples' unique cultures and identities in the different parts of the world. The success of the lecture symposium held at the UP Diliman College of Education in response to the UNESCO's call is a show of the institution's strong advocacy for embracing diversity - a move for inclusion of every Filipino from different ethnolinguistic groups in the country. 1. While teaching Filipino at the college level is considered vital for some, especially those who currently teach the language and those with strong nationalistic sentiments, let us keep in mind that there is a wide diversity of opinion on this issue, and media coverage should reflect this diversity in a balanced way. For some, the Supreme Court’s decision was a painful blow. For others, it was a welcome relief. It is important to understand the factors behind these various opinions and share them with the public. 2. The claim that the Supreme Court and CHED are removing Filipino is misleading and hyperbolic. The Supreme Court merely ruled that CHED’s new general education curriculum (CMO 20 s. 2013) is constitutional. The curriculum includes 36 units of general subjects. To require a specific language subject in this curriculum, whether Filipino or English, would contravene the purpose of general education. However, CMO 20 makes it clear that any of the required gen ed subjects may be taught using Filipino or English, so there is nothing stopping a university nor instructors from using the national language. They could even teach all of the subjects using Filipino if they wanted to. Moreover, in addition to the gen ed subjects, universities could add as many Filipino subjects as they wanted to, whether elective or mandatory. Thus, it is simply a scare tactic to claim that the Supreme Court’s decision constitutes the abolition of Filipino. 3. Supporters of requiring Filipino in college have ignored the fact that Filipino is not the only language in the country. The Philippines is multilingual—with more than 100 native languages (KWF, 2014; Ethnologue, 2018). Our Philippine languages are informally (yet incorrectly) called dialects. They are just as important as the national language to our history, heritage, culture and communities. If ever there would be a language requirement in college, we support a fairer policy that would allow the teaching of any Philippine language (e.g. Tagalog, Cebuano, Ilokano, Waray, Bikol, Hiligaynon, Pangasinan, Maguindanaon, and other indigenous languages) towards the fulfillment of such a requirement. This would promote equality, allow greater understanding of our peoples’ origins, and empower our communities to create music, literature, film, and educational materials in their respective languages. institutions of higher learning” (Article XIV, Section 5), which is also enshrined in the Higher Education Act of 1994 (R.A. 7722). Colleges should therefore have the choice about what languages to mandate or offer. It should be noted that none of the world’s top 10 universities, never mind the countries they are located in, require a specific language subject for all their students. If students are required to take up a language, students have a choice about what language they will learn. To mandate a specific language, regardless of its political status, is contradictory to academic freedom and personal freedom. 5. We support greater flexibility with regard to the languages taught and used in higher education so that colleges can meet the needs of their students and communities. Languages are tools for communication, employment, and many other aspects of our lives. The decision to use what language and how should be based on context, such as the local economy, availability of instructional materials, the capacities of instructors, the skills that students seek, and the vision, mission, and research priorities of the institution. 6. Continuity of employment is a major concern. However, the claim that thousands of instructors would lose their jobs is also inaccurate. First of all, DepEd is very open to hiring Filipino instructors for their growing Senior High School program. Secondly, higher education institutions are allowed to continue offering Filipino subjects. Thirdly, the existing Filipino instructors can apply internal pressure for the continuation of the Filipino subjects they handle. Fourthly, there are still 36 general education units which they can teach, whether some of these units are allocated for Filipino, other languages, or electives. 7. People continue to lambast CHED and the Supreme Court for not respecting “ang ating sariling wika at kultura”. In fact, we have many “sariling wika at kultura”. Our other languages have never had the privilege to be required courses in college, even in their native regions. And experts in these languages have not had the privilege of employment like the thousands of Filipino/Tagalog instructors. Is this fair? Is it a “colonial mentality” to ask for more representation and equality among our native languages? Request for inclusion is not colonial nor regionalistic, it is judicious and equitable. curriculum, then not only instructors who are proficient in English or Filipino/Tagalog will be able to teach said subjects, but also those who are proficient in other Philippine languages as well. This will create more dynamic, diverse, and inclusive language departments. Writers, poets, linguists, researchers and teachers of various languages could be tapped to share their expertise. 9. The Indigenous Peoples’ Rights Act of 1997 (R.A. 8371) gives indigenous peoples (IP) and indigenous cultural communities (IPPs) the right to “education in their own language, in a manner appropriate to their cultural methods of teaching and learning” (Chp. VI, Sec. 30). The Act further states, “the State shall endeavor to have the dignity and diversity of the cultures, traditions, histories and aspirations of the ICCs/IPs appropriately reflected in all forms of education” (Chp. VI, Sec. 31). If only one language is to be mandated in the gen ed curriculum, and all students are mandated to take it, then this policy could violate indigenous students’ rights. By contrast, if CHED will permit any local language to be used in the mandated subjects, including IP languages, then CHED will ensure that General Education is more appropriate to IP communities and will safeguard their right to education in their own language. 10. For too long, Filipinos have been unnecessarily restricted in their language options in higher education. Non-Tagalog people have had to learn the national language (based primarily on Tagalog), but Tagalog people have not had the chance to learn other Philippine tongues. Having a flexible language policy in higher education will open up opportunities for Filipinos to learn each other’s languages, provide more communication options, prepare them for inter-island travel and work, build mutual respect and appreciation, and strive for “unity in diversity” (Constitution, Article XIV, Section 14). Flexible language policies will also open the door to learn foreign languages for economic and social opportunities. 11. The Living Tongues Institute of Endangered Languages classifies the Philippines as one of the Top 10 “language hotspots” of the world, which means that it has a rich yet fragile linguistic heritage. The KWF meanwhile has reported that more than 40 Philippine languages are endangered. These are minority languages spoken in just a few places. While it is understandable that many people care about the national language, it is not threatened to the same degree that our truly endangered languages are. Therefore, it is important to give them a chance to be taught and learned as well. Hence, if a language requirement is retained in the higher education curriculum, we again support the eligibility of all Philippine languages, whether national, regional, or local, to be taken up in fulfillment of such a requirement. Nationalism is not the same as patriotism. Homogeneity is not the same as equality. Imposing or prioritizing one language is not the best way to combat colonialism. Let us promote Philippine languages in an inclusive way, and allow any of them to be taught in higher education. Inclusive, flexible, and pluralistic language policies contribute to sustainable development and peace (UNESCO, 2012).